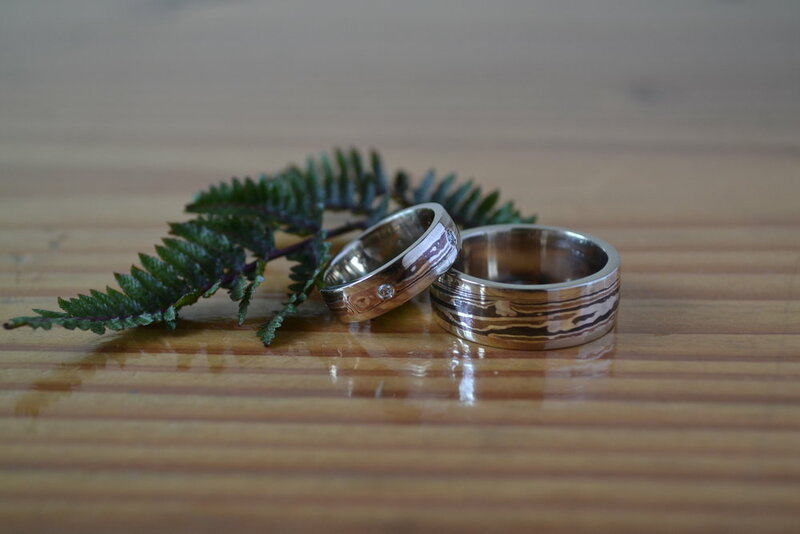 Dehv and Jayne's custom Mokume Gane wedding bands. The finished waxes are ready to be cast into 14k white gold. The mokume billet is roughly worked to expose patterns in the different layers of the stock material. You can only work the metal so much before it cracks, by heating it to a dull red glow (annealing) between steps you avoid damaging the stock. This is where the patterning truely emerges. Then soldered in place.... Here the rings are shown with a 14k white gold bezel and diamond that is due to be put into Jayne's ring. I continue to remove material as I work the metal, esensially following the pattern in a desired direction. In this picture Jayne's ring has been filed and sanded and the placement of the stones has been marked. I'm now drilling the guide holes for the settings. And finally... Diamonds!! Beautiful unique rings for a beautiful and unique couple! DuKo designs specializes in custom engagement rings and wedding bands and creates all sorts of jewellery pieces. I'm not limited to creating jewellery objects though. People have contacted me to put my skills to use on many different projects. I've now made three board games. The chess set pictured on the left is made of walnut with hand carved and cast, solid sterling silver pieces. This set depicts ancient Aztecs versus modern Bauhaus figures, they have turquoise and amber accents set into the kings and queens. I recently made the crib board, pictured at right, as a birthday gift for my fiance. The board was made from a piece of maple, the pegs are solid sterling silver and they tuck away inside, when not in use. The last game is Mancala, possibly the worlds oldest game. Mine is made from walnut with sterling silver hinges and clasps, the counting pieces are quartz, tigers eye, hematite, and agate. These sorts of projects are challenging and a true pleasure to make. Let me know if you're in the market for a truly unique and deluxe gift or gaming experience. picked out fluoresces under black light, not all do, not everyone considers it desirable, I think its pretty neat. I spent the next many months designing the ring in my mind and saving my pennies, literally. My diamond broker told me that mine was the first diamond that he had ever seen purchased partially with rolled change. Once the stone was in my possession I set about making plans to propose.... Oh ya, and I had the rare honor of building the ring that my fiance now treasures. White gold and sterling silver mokume gane is a favorite of both hers and mine so naturally I wanted to incorporate it. I built the frame and setting out of 19k white gold for both strength and beauty. I inlay-ed the mokume gane, marked out the placement of the diamond accents, drilled holes and soldered in more 19k white gold. Now my diamond gypsy set accents will be surrounded by another edge of 19k white gold, a time consuming detail but one that I'm very pleased with. Everything needed to be filed and sanded to shape and the main setting needed to be soldered in place. Some polishing and then it was time to address the diamonds, two of my accent stones are black diamonds to continue in the black and white theme that I started with the mokume gane. I set the stones and moved on to even more challenging parts of the procedure..... I told/ asked her father, which turned out to be more nerve racking than I thought it would be. His response "right on! ", set me at ease. I borrowed a camera from a photographer friend of mine, one that had the ability to be set up and take photo after photo so that our proposal could be captured in stop motion. The results were amazing, if I can get some tech help I'll attempt to post the short video clip at some point. I chose to propose in a spot close to my fiances home town, on a hike she had been dying to take me on. Inspiration is a funny thing. It can come from anywhere. You don't always need to have all the details sorted out either, part of my job is helping in the process. Some of my clients bring me their ideas already completed and all that's left for me to do is build the design. Other clients have an idea that we develop together, some people need me to take the lead on the entire process, everyone and every job is different. The Diamond engagement ring pictured above is a modified replica of my clients girlfriends favorite ruby ring that she wore every day. I built a Sterling Silver 1957 Chevy belt buckle based solely on a picture that my client brought to me. A recent client wanted engraving that was symbolic and had meaning to both he and his girlfriend. After much back and forth I prompted him to think of travels they had had together and places they had been, objects that they had purchased while abroad that were prominent in their home. He settled on a replica of some patterning in a carpet that they had brought home from the middle east. It's a focal point in there living room and now in her ring as well. Keep an open mind and inspiration will find you, if it's taking too long, call me and let me help. It's common for people to have jewellery sitting in a box that they no longer wear. This occurs for a variety of reasons, it may be that the jewellery piece has fallen out of style or that the owner has just become uninterested or bored with it. Maybe all that is needed is a little modification...? Such was the case with this 18k yellow gold and Platinum ring that I recently took a file and sand paper to. 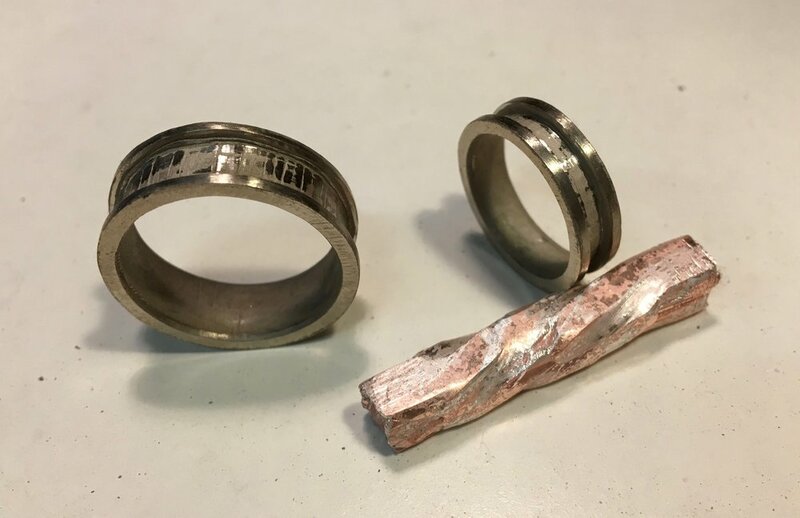 While the ring on the left is unique and interesting, it is also somewhat dated and needed a little tlc to become what my client really wanted. The end result, shown at right is cleaner and simpler, and will stand the test of time with it's much more classic lines and lighter feel. This past summer I had the opportunity to design and make a truly unique one of a kind ring. My client brought me a gorgeous Ruby and a vision, the rest was up to me. He wanted a large chunky man's ring in both white and yellow gold with hand engraved details throughout. The project evolved as w e went and I was pleased at my clients patients as I required shoulder surgery part way through the job. He opted to wait and have me see the project through to completion rather than have me take it elsewhere to have it finished. Thanks Martin. I carved the main body of the ring out of wax and had it cast in 14k white gold. I added 14k yellow gold details, including a removable stone bezel that I set from behind. By doing this the center stone can be rem oved for re-sizing or any other work or repairs that may be required in the future. It turns out that this ring is going to be my clients gift to himself for becoming a Canadian citizen, so his choice of what to get hand engraved was only fitting. this paper on my finished wax ring and scribed through the paper and into the wax. Using dental tools I cleaned it all up and prepared my wax for casting. Once cast into sterling silver I filed and sanded the metal before adding the hammer marks that would aid in giving me an ancient look. I patina-ed the ring to add depth to the recessed symbols, and then p olished it to a high shine. A personalized message was hand engraved on the inside in Latin and this inspiring piece was ready to be presented to it's new owner. I've been dry-walling and painting, building walls, making signs and applying graphics... Oh ya, and making jewelery! I'm in the last week of what has been a very busy last few months but I'm just about ready. On Saturday February 12th at 1:00 I will be opening the doors of 'D' Gallery!!! Please come for a delicious Red Truck lager or a glass of wine and to view my jewelery as well as the paintings of Lindsey Kyoko Adams.